Great Wall - Next to the Egyptian pyramids, the Great Wall of China is probably the most enduring man-made structure in history. Built to protect the various Chinese dynasties from northern invaders, the earliest fortifications date back to 7th century B.C. However, the first large scale production project was begun under Qin Shĭ Huángdi. This was possible due to the fact that he had unified China for the first time in history. China's northern border was a vast open territory highly susceptible to attack from nomadic tribes. One of the most dangerous of these was the Xiongnu. Many consider the Xiongnu to be the ancestors of the barbarian Huns (see Atilla the Hun) which invaded the Roman Empire centuries later, but others dispute this. Once unified, Qin Shĭ Huángdi went to work protecting his northern border with a new and improved defense, a great wall. And when I say he went to work, what I mean to say is, he ordered his subjects to build his new wall. For the Great Wall is built with blood as much as it is with mortar. No records survive to indicate total cost of construction, but it's estimated that perhaps up to one million humans died building the wall during the Qin era. Over the centuries, the wall was repaired and expanded upon, and most of what we see today was built during the Ming Dynasty. 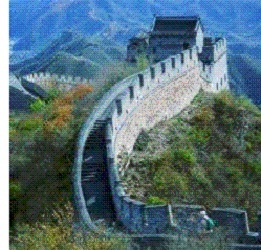 In total, from east to west, the Great Wall stretches 5,500 miles (8,852km). Had it been known by Westerners in ancient times, it almost certainly would have been included on their list of ancient wonders.